"People by and large are idiots." Wow, does this ever ring true, especially on a day when some of my fellow Minnesotans showed up and cheered for the current White House resident despite all the ugly things he's said and done. How can people do that?! It's completely incomprehensible to me; they are completely incomprehensible to me. This feeling is at the core of the new play Understood by Tyler Mills, which Trademark Theater is intentionally producing running up to next month's midterm election. Director Tyler Michaels notes in the program, "This play swirls around these two ideas: A broken couple and a broken country." In this thoughtful and thought-provoking two-hander, a married couple is looking to be understood by each other, the one that is supposed to know and love them best, and also by a stranger whose beliefs are inexplicable to them. The play covers all the topics that we're supposed to avoid at dinner parties, namely religion, politics, and personal traumas. 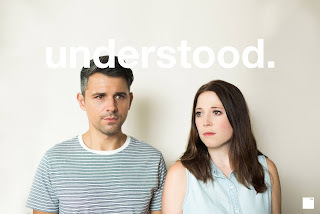 Julie and Chris are in a rough spot in their marriage, feeling disconnected from each other for reasons even they don't understand. The structure of the play is that we flash back to happier times to get a sense of who they used to be and what got them here. Julie decides to take a break and visit her sister in a small town (who she suspects voted for he who shall remain nameless). She seeks out a high school friend whose beliefs differ greatly from her own, and begins a conversation in an attempt to understand. Meanwhile, Chris gets a wrong number call from a woman calling through a church outreach program to talk to people about God. They also begin talking, and finding a connection despite their differences. Topics covered include abortion, gun control, and LGBTQ rights, so we get into some pretty uncomfortable territory. Under Tyler Michael's clear and decisive direction, actors Adelin Phelps and Sasha Andreev (who play both the central couple and the "other") both give raw and natural performances. At a distance of just a few feet away from the audience, there's nowhere to hide, and you can really see the emotion on their faces and hear it in their voices. They have great chemistry together and work together well; I especially love the awkward silences when the characters don't know what to say (as happens often in life, but not as often in theater), and when they both talk at once. I imagine that's a difficult thing to get right, and the team does it well. I'm not sure how we got to this place of such extreme divisiveness, and it's difficult to even imagine a way out of it. Understood suggests that maybe it begins with a conversation, with speaking truthfully and really listening, without judgement. Maybe people aren't idiots, maybe they're just misunderstood. Well, some of them anyway. This is only Trademark's second production, and it's so different from their debut - an original adaptation The Boy and Robin Hood, featuring a large cast and music. They're already showing great range, and it makes me excited to see what's next for them. Understood continues through October 28. Click here for info and tickets.